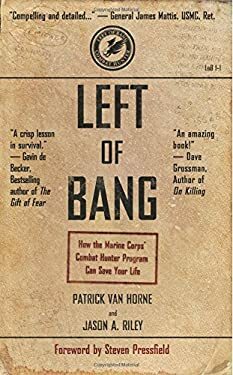 "Like Sun Tzu's THE ART OF WAR, LEFT OF BANG isn't just for the military. It's a must read for anyone who has ever had a gut feeling that something's not quite right...be it walking down the street, sitting in a corporate boardroom, or even entering an empty home." -- Steven Pressfield, bestselling author of THE WARRIOR ETHOS, GATES OF FIRE, and THE WAR OF ART. -- You walk into a restaurant and get an immediate sense that you should leave. -- You are about to step onto an elevator with a stranger and something stops you. -- You interview a potential new employee who has the resume to do the job, but something tells you not to offer a position. These scenarios all represent LEFT OF BANG, the moments before something bad happens. But how many times have you talked yourself out of leaving the restaurant, getting off the elevator, or getting over your silly "gut" feeling about someone? Is there a way to not just listen to your inner protector more, but to actually increase your sensitivity to threats before they happen? Legendary Marine General James Mattis asked the same question and issued a directive to operationalize the Marine Corps' Combat Hunter program. A comprehensive and no-nonsense approach to heightening each and every one of our gifts of fear, LEFT OF BANG is the result. New (4140 available) BRAND NEW. Over 1.5 million happy customers. 100% money-back guarantee. Make your purchase count: support Better World Books' worldwide literacy partners.